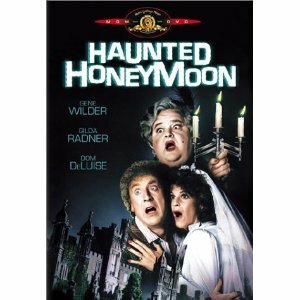 Haunted Honeymoon (1986) starring Gene Wilder, Gilda Radner and Dom DeLuise is a comedy/horror movie that takes place in the 40s. Larry Abbot (Wilder) and Vickie Pearle (Radner) are popular actors on a radio horror serial. The couple heads off to Larry's childhood home, a huge Gothic castle where his Aunt Kate (Dom DeLuise) lives, to get married. At the castle, we meet all the eccentric family members who have come for the wedding. Aunt Kate is the bigger than life matriarch of the family (a delightfully funny performance by Dom DeLuise) and as soon as the guests converge for dinner, she announces the place and family is haunted by a curse that turned one of them into a werewolf. Larry thinks he's there to just to get married but his Uncle has planned to "scare him to death" to help cure Larry's mental disorder. Something goes wrong when real dead bodies start to pile up. This movie brings out all the classic and cliched atmosphere that a horror movie should have which adds to the funny scares this movie provides. The castle is huge and gloomy. The thunder and lightning are ever-present. The interior of the castle is wonderfully grand and spooky with billowing curtains, secret passageways and candlelit scenes. This is a fun comedy horror movie to catch on TV or find on video. The musical scene with Aunt Kate and the Vickie (the always wonderful Gilda Radner) is worth the movie alone. This movie is a blast to watch and enjoy!